On this 9-hour tour, visit Niagara Falls, Niagara-on-the-Lake and enjoy a structured wine tasting. See sights like the Whirlpool Rapids, Sir Adam Beck power stations, Floral Clock, Queenston Heights, Laura Secord homestead, Mackenzie House, smallest church, the historic Fort George, and more. Learn a little history, enjoy natural splendors, and have free time to shop for souvenirs. This tour has something for everyone. Your tour includes complimentary pickup service from most downtown Toronto hotels. You will depart at 9am (hotel pick up prior to this time) and journey around Lake Ontario passing the famous credit river, Hamilton, St. Catherine's, and Welland Canal into Niagara Falls. Once you get an orientation of the falls, you have free time to explore. 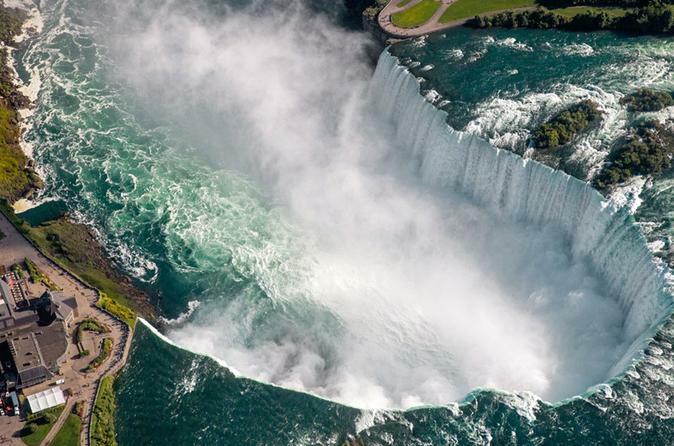 Get the closest view of the Canadian Horseshoe Falls. After a well deserved day at the falls, return back with your tour group and head along the Niagara parkway. On this route, you will be able to take pictures and learn the history of the war of 1812, Whirlpool Rapids, Sir Adam Beck power stations, Floral Clock, Queenston Heights, Laura Secord homestead, Mackenzie House, smallest church, and the historic Fort George. Lastly, head to Niagara-on-the-Lake and spend some free time in this beautiful town. Enjoy breathtaking views of Lake Ontario, take a horse and carriage ride, or just enjoy a leisurely walk and some of the best ice cream! Lets not forget our stop at a local winery to sample some ice wine. You will once more return with the tour group and head back to the city of Toronto.